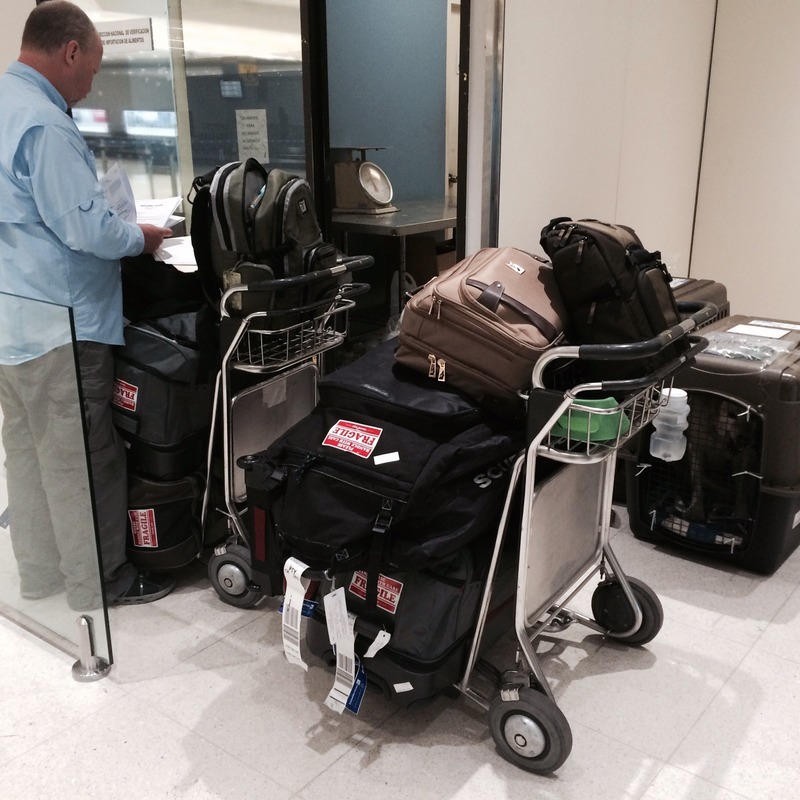 When we moved to Panama, we went through a lot of soul-searching to figure out what to take with us. Of course our two kids (dogs), Maggie and Rosie, were never part of that discussion. Ensuring their safe travel and legal entry into Panama was one of the most important (and most nerve-wracking) aspects of the move. 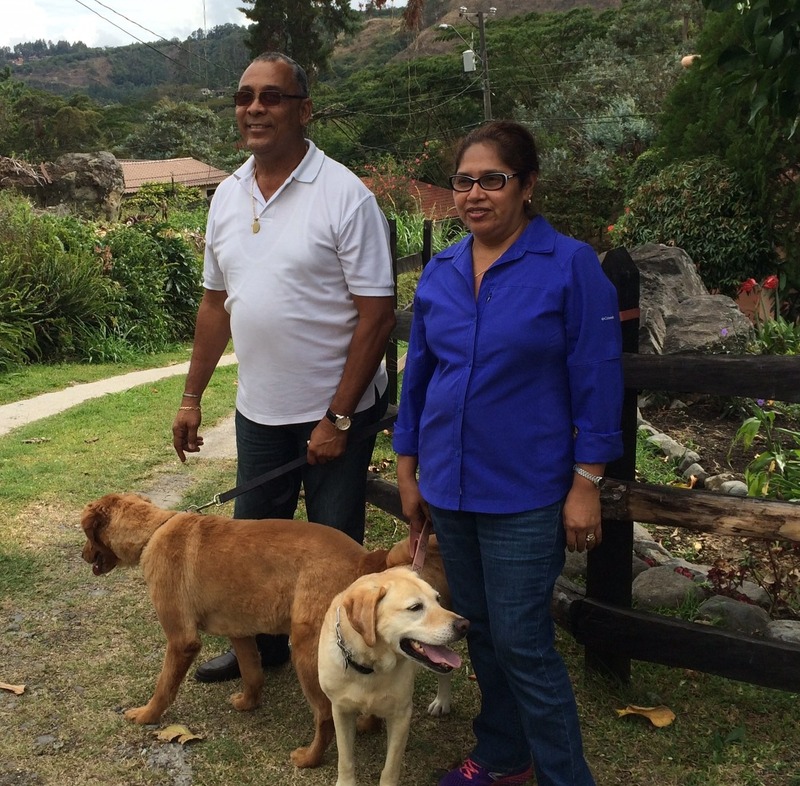 This post is for the benefit of our pet-owning readers who are contemplating a move to Panama. Of course, it’s our own experience and your mileage may vary, but hopefully this will give you some idea of the process.The trickiest part was the timing, especially for planning nuts like us who prefer to do as much, as far in advance, as possible. Dropping the girls off at Copa Cargo. Not an easy moment for Mom or Dad, but everything worked out beautifully! Tocumen Airport (PTY) on one of Panama’s numerous holidays; otherwise, the Ministry of Health (MINSA) vet might not be there to clear your pets into the country and they could land in airport quarantine (you don’t want that). Flying on a Friday is probably not a good idea for the same reason, and try to arrive somewhat early in the day. Also, many airlines don’t allow pets to fly in cargo during summer months for their own safety. Find out when you can get your pets on a flight first, then book yourselves on the same flight. We took a red-eye on Wednesday evening and landed at 8:30 Thursday morning, which gave us an extra day in case of flight delays or cancellation. Get rabies vaccinations and rabies certificate signed by your vet. NOTE – you might read on more than one website that this has to be done at least 30 days before travel. We waited until 10 days before we flew, and then had a moment of panic when we saw those websites. After a call to our agent in Panama, we knew we’d be OK, but you might as well get the shots done early since this is one of the few paperwork items you can do well in advance (but don’t do it too early – the shots cannot be given more than 12 months before entering Panama). No one asked, but we made sure their other vaccinations (bordatella, lepto) were up to date as well. Get your crates and get your pets acclimated to them. 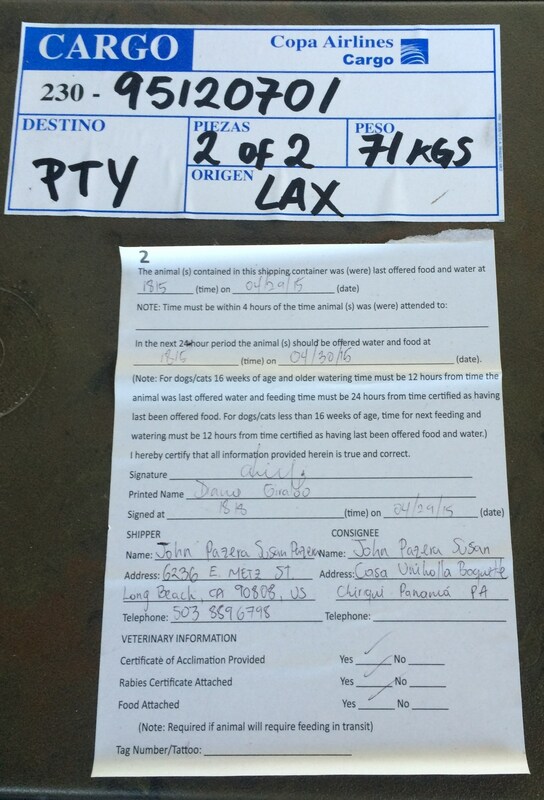 Check with your airline for specific requirements on crate size, fasteners, etc. 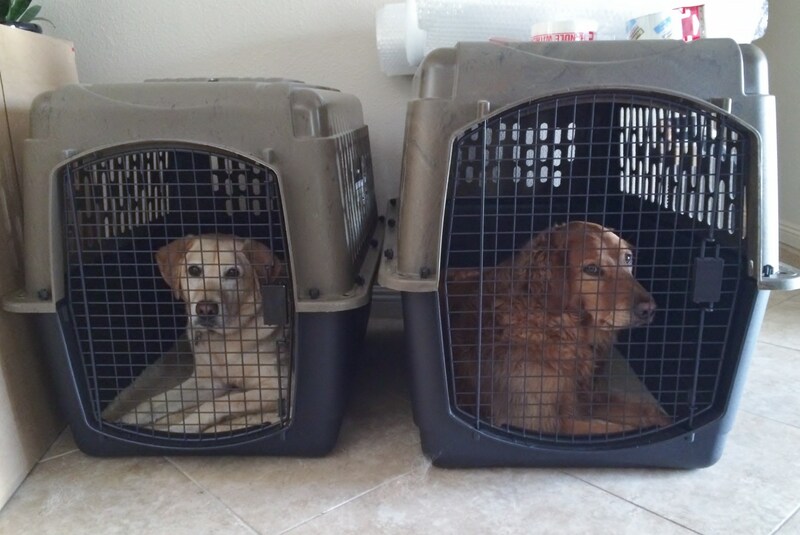 Our dogs were crate-trained as puppies, but if yours weren’t, you’ll need to get them used to the idea of spending a significant period of time in the crate (for our girls, it was almost 14 hours from the time we dropped them off at cargo to the time we could get them out at PTY!). Start with just a few minutes and work to up to overnights, with plenty of treats and rewards to make it fun.You might see special travel kits for sale that include “live animal” stickers, cable ties, and special heavy-duty crate fasteners, but check with your airline first. All we had to provide was an externally attached water bottle (we used these), a zip loc bag of dry food, and a non-slip liner for each crate (we used old bath mats). Copa supplied everything else, including stickers. Some of the paperwork Copa attached to each crate. office and went through the procedures and timing with them. A couple of weeks before we flew, we paid a visit there and met the ops manager. We showed him our crates and photos of our dogs inside them, to make sure we wouldn’t have any surprises on our travel day. In addition to getting us familiar with the drop-off location (it was a couple of miles away from the passenger terminal at LAX), this gave us a huge boost in confidence and peace of mind. Your vet will need to examine each pet and complete the USDA’s APHIS Form 7001. Click here for more info about it from the USDA website. NEXT, get the form endorsed and signed by the USDA. Since we lived in the LA area, we were fortunate enough to be within driving distance of a USDA APHIS district office. If that’s not the case for you, be sure to plan for overnighting the form to a remote office and then having them overnight it back to you. NEXT, get the form apostiled (signed and endorsed) by the Panamanian consulate. Again, we happened to have a consular office right in our home city of Long Beach, but you might need to have it overnighted to the nearest consulate. Rosie’s USDA APHIS Form 7001, signed by our vet and the USDA vet, with the Panamanian endorsements on the back. Call the airline cargo office to give them your travel info and fax or email your signed, endorsed, and apostiled forms to them. (Note – this was our experience with COPA. Your airline might have different requirements). Re-confirm your drop off time and location. Panama’s Ministry of Health (MINSA) Quarantine for Domestic Animals form must be completed, signed, and sent to the Ministry of Health. Our agent, Jose, handled this part. At the MINSA office, waiting with all of our luggage and both dog crates for the vet to clear the girls into Panama. Our dog crates came out a separate conveyer just past the baggage claim, and just outside the MINSA office. 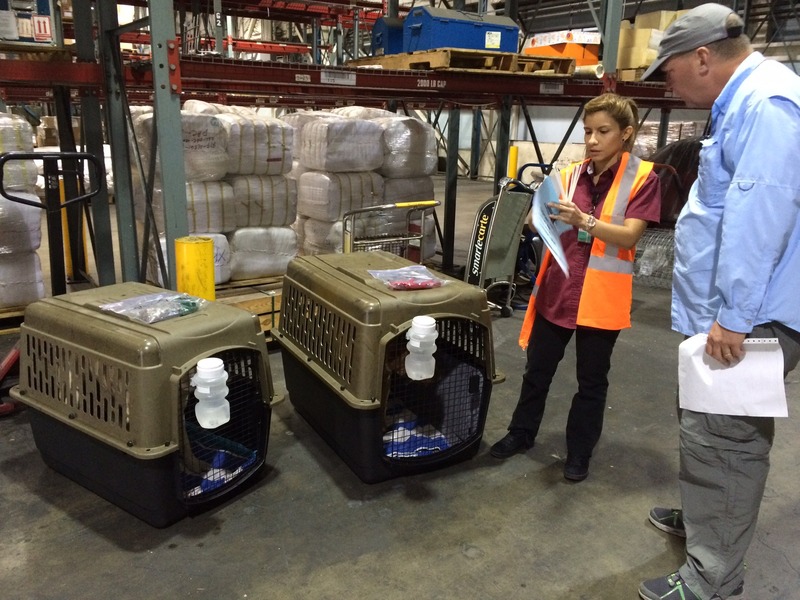 There were attendants waiting to load them on to a cart and take them over to be approved by the Panamanian vet. We presented the MINSA form and APHIS form, paid the necessary fees for home quarantine (which really means they won’t have to be quarantined by the Panamanian authorities in Panama City), and were on our way. can’t say enough about the outstanding service and peace of mind he gave us throughout this process, especially in dealing with the MINSA officials in Panama. He has been doing this for more than 16 years and has assisted hundreds of animals in arriving and departing from PTY. Jose and his wife Lucy handled getting the MINSA form submitted on time, met us at the MINSA office, facilitated the vet approval, and then drove us to our Panama City hotel for the night. The next day they drove us across the country to our new home in Boquete. 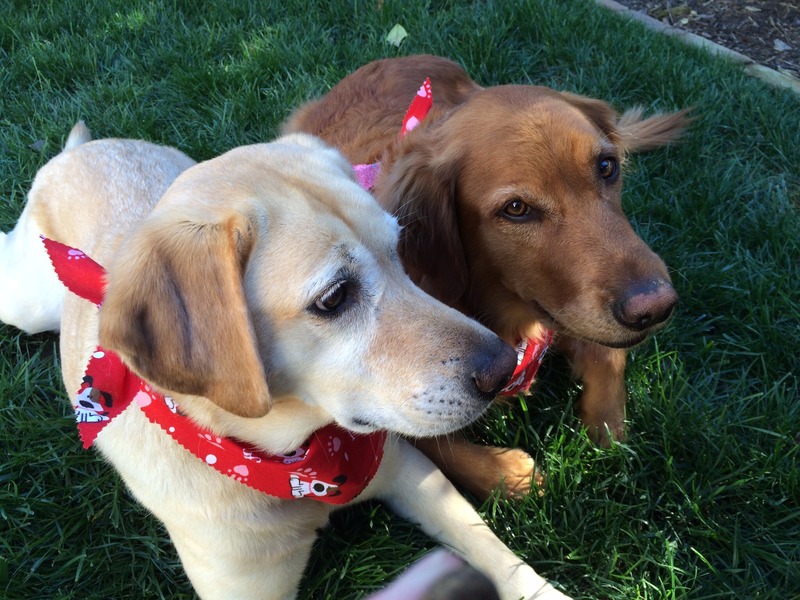 Although we chose to leave our dog with our daughter and grandson due to all the things you have to do and the costs, you have written a very excellent step-by-step “how-to” for those who chose to bring their animals with them. Our alternative was to rescue and adopt a dog here (along with 6 cats now). It’s Renee. Just want to tell you THANK YOU (yes I am yelling and jumping up and down). You really have made sound simple, that which others have seemed to make complicated. We have two beautiful healthy Golden Retriever boys who we must bring with us when we move and this has eased my mind so much! Thank you, Thank you, Thank you. I know this will be a little time consuming and tedious but thanks to your information it really seems doable. Thank you again! We’re SO glad it’s helpful. It’s just a lot of leg work but it’s amazing how it all falls into place. Before you know it you’ll be down here with your boys (maybe we should have a play date with our girls!). Keep us posted on your plans. Thanks for the invitation, I’m sure my boys would love your girls they are quite the ladies men (that’s why they are neutered!). I am really looking forward to meeting you all. When do you think the best time of year will be for our first visit? I am afraid that you may have misinterpreted my earlier response. My husband, Ken and I will be visiting only to look at David and west to Puerto Armuelles (approx. 2 weeks). We have no interest in Boquete due to the expense. We intend to visit Boquete after we move there (about two years from now, possibly a little bit sooner, maybe), I have heard about the Tuesday Expat meetings and they intrigue me. We are just trying to determine what time of year would give us the best snap shot of the weather and environment and hope to make some contacts with expats in the David/West area, ie; rental properties, best neighborhoods (Panamanian), contacts (lawyers, expat hand holders, etc). Thanks for any help or advice from anyone out there!